It's painfully quiet around my blog these days, that's because we are living outdoors. The weather here has been fabulous and not a day has passed that we haven't spent it outside. When we do come in, it is to quickly put together a meal and try to get organized for the next activity. 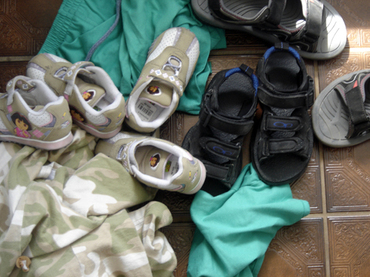 My home is starting to look like a summer cottage with heaps of clothing and shoes in piles all about as the kids change from one outfit to another trying to keep the sand box out of the house. It's a losing battle keeping the sand & dirt outside, but still we try. I'm having a hard time working my brain around all that (seemingly) needs to be done. So far we have managed to give the back yard a good clean and this weekend we really need to get to the front yard. Things are wanting to grow and the winter kill is getting in the way. In addition to cleaning I've been dreaming of my garden. A yearly occurrence here as I add more flowers & plants in hopes of creating something beautiful. There are a couple of gardens that are now empty as a result of work we did on our home last year. 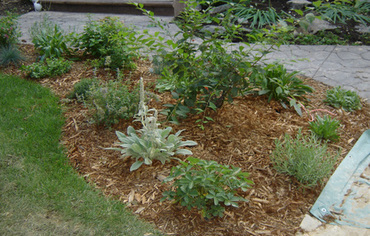 They are a fresh canvas waiting to be filled with shade tolerant shrubs, perennials & annuals. I need to get a plan...and quick! To add to this I still have a few piles of winter clothing, jackets, boots, mitts & hats that are lying around waiting to be put back into storage for another year. It is so strange looking at those items when there is no snow to be found. I find myself doubting that winter was a reality. I am so glad that spring is here with summer on her way. I am definitely a "summer" person. I love it hot and sunny, wearing light weight clothing, parks, beaches, bike rides, walks, late night bonfires, marshmallows, birds, nature, butterflies, caterpillars, bunnies and so much more that brings to mind the lovelies of summer. Ahh...let the summer festivities begin. Sounds like my life right now. I went to the library over the weekend and took out a whole load of gardening books. Not sure what makes me think I'll even get around to the looking of the books, nevermind the actual gardening. Can't do it all, even though I often with I could.